New Delhi, June 8 (UNI) Two departments of Defence ministry appeared to be at cross purposes in ensuring implementation of the Military Service Pay (MSP). The move would lead to a monetary loss of around 1.40 lakh defence personnel, sources in the Defence ministry told UNI. 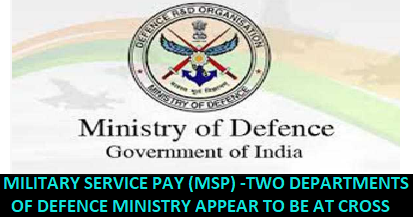 In the 6th Central Pay Commission (CPC), the MSP was granted to Defence personnel in place of Rank, Pay and Compensation for edge in pay. It was treated as pay for all purpose, except for calculation of annual increment. While in 7th CPC, the MSP was to be counted as pay for purpose of computation of dearness allowances and pension. For more clarity, the DoD has requested the Finance ministry for assistance. The guidelines are still awaited. As per the sources, a large number of pay and allowances are still pending with the DoD, impacting over 13.5 lakh personnel.